It's been quite some time since I've done a Libation Education, but don't worry lushes, because I have a few coming down the pipeline. My home bar has been steadily growing over the past year and a half, and these things take time. I mentioned a couple of weeks ago in my posting for the Italian's Last Word cocktail about my obsession with Green Chartreuse. You might remember it as that weird liqueur you'd occasionally see on a cocktail menu, or that bottle gathering dust on the back of the bar. Well, this monastic libation is finally shedding its cloak and having a total revival. Why is it that monks make such good alcohol? Beer, wine, Frangelico and who knows what else. Back in 1605, the order of the Carthusian monks in Vauvert, near Paris, received a gift of an ancient manuscript for an elixir from a Marshal of King Henri IV's artillery. The recipe was nicknamed the "Elixir of Long Life" and was created by an alchemist who blended about 130 herbs and flowers to create a healing tonic. The manuscript was eventually sent to La Grande Chartreuse, the head monastery located in the mountains of the same name near Grenoble, to be studied. Thanks to Frère Jerome Maubec, he finally translated the manuscript in 1737 and wrote up the formula. 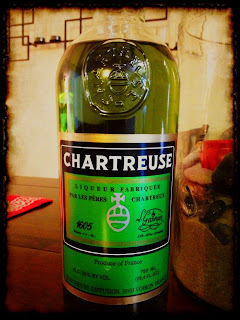 From there, the monks started making the "Elixir Vegetal de la Grande-Chartreuse" and selling small bottles of it in nearby towns. In 1764, the monks started to realize that people were enjoying the elixir as a beverage as opposed to just a medicine, and made a slightly lower-proof version at 110 (still pretty high!). Sound familiar? The history of the liqueur is actually really fascinating - religion and politics nearly squashed it's existence, but it persevered. Green Chartreuse stakes a claim that it's the only naturally green liqueur, and it gets that color from all the chlorophyll from those 130 plants. The herbs and flowers are all macerated with a neutral spirit and then distilled and aged for about five years in oak casks. It has a sweet and slightly vegetal flavor, with hints of citrus, thyme, rosemary, clove and cinnamon. There's also Yellow Chartreuse, a sweeter and more mild cousin at 80 proof, that was developed in 1838. It also gets its natural yellow color from all the plants and flowers macerated in there. The flavor still has hints of citrus, but also some honey and lavendar. You can drink either of these liqueurs straight, on the rocks or mixed in with cocktails (I prefer the latter). Check out this site next Thursday when I'll be posting another cocktail recipe with this holy and healthy tonic.